River Valley Development is a 60+ acre mixed use development with retail leasing, office and medical space, as well as commercial and industrial. We also have apartment rentals. (www.plvapartments.com) The entire site has natural gas available, City sewer and water, storm and sanitary sewer, paved city and private roads throughout and bordered and accessed on the South by state highway M-82 and on the West by state highway M-37. River Valley Development already has some great retailers that have become an integrel part of Newaygo. From grocery shopping, to Hardware and farm supplies, tax preperation and more, nearly everything one needs in located in one central location. There are a few locations still open, as well as a few open lots. 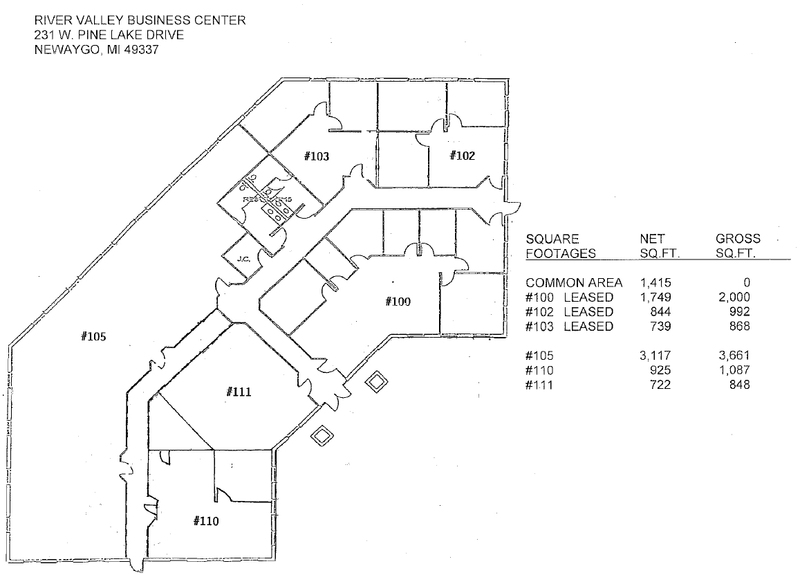 View our retail leasing page here - or view our aerial view page to see what is still available. Our River Valley Business center is perfect for additional office space or medical office leasing. View the Floor Plans here. retail leasing page here - or view our Office and medical space for more information. We have a handful of lots still available for great ownership and real estate development opportunities. View an arial view of the Ownership opportunities - Contact Kathleen A. Culp for pricing and further information. We have an apartment complex on the grounds called Pine Lake Village Apartments. From one, two and three bedroom apartments to choose from, with great rates within walking distance of eveything one needs. If you would like more information please view: www.plvapartments.com.